This maybe an old issue but some developers may have this problem unresolved. Cross-site request forgery protection is important for your application thus letting this off could harm your application and let the attacker easily penetrate it. Codeigniter already has this feature built-in and you dont need to worry about it. All you need is just a little tweak to the core Security library as Codeigniter only allow POST method for the CSRF protection and yet in fact we can have PUT, PATCH and DELETE method. From here your codeigniter is ready to use CSRF protection but you are not for the Ajax call. In angular, generally we have to attach the CSRF Token on every ajax Call specially with POST, OUT, PATCH and DELETE http verb. We can utilize the power of Angular httpInterceptor with a little help from Angular Cookies library. You are done. test your configuration now and check its working properly. 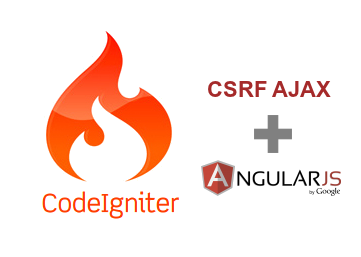 Now everytime you POST, PUT, DELETE something in your application, Codeigniter will validate the csrf token and immediately invalidate it and regenerate new token for you so your next Ajax call will use different token. but this option is less secure than the default one.